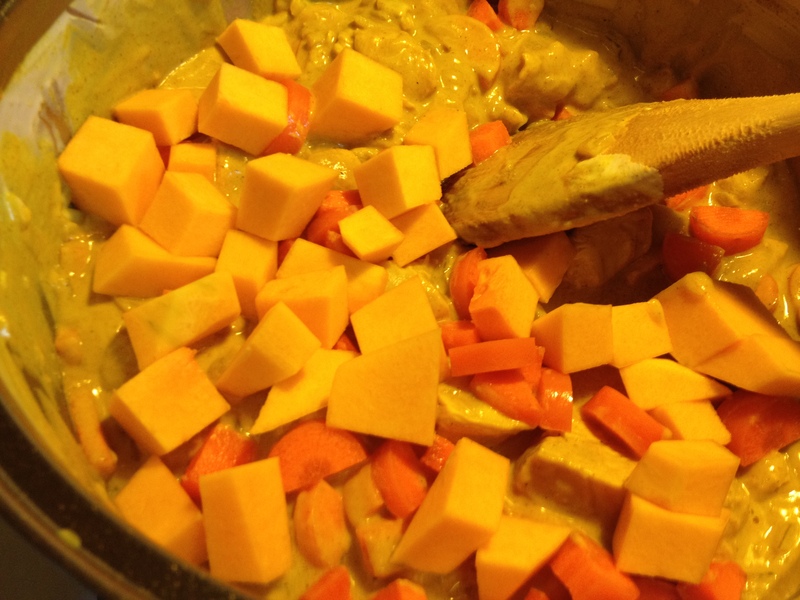 Chicken curry is one of my go-to meals when I need something nurturing. 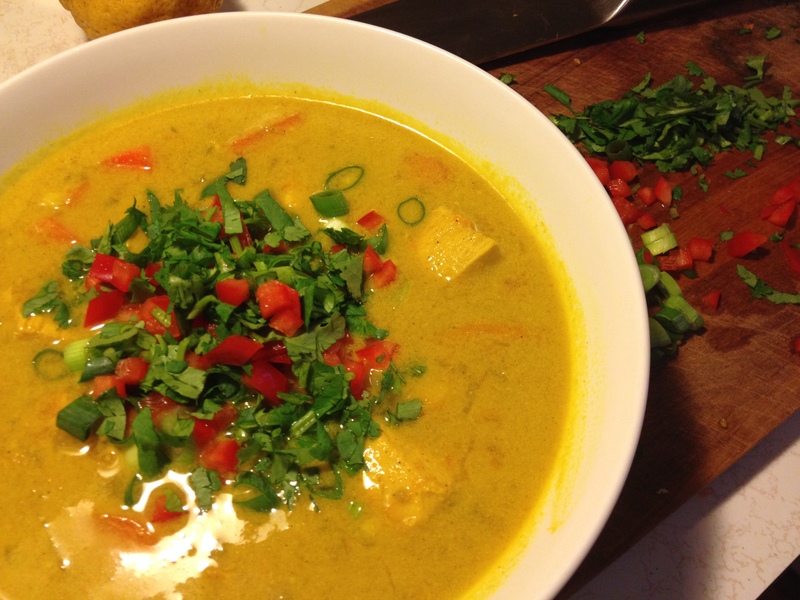 This curry is mild, although you can ramp up the spiciness to your own taste. The recipe will serve four, and is also easily doubled. If you’re cooking for one don’t be put off by the quantities. It freezes and reheats well, and there is something very reassuring about having a few good meals waiting for you in the freezer for those days when cooking is too much effort. Carrots and pumpkin provide anti-oxidants, fibre, phyto-nutrients and loads of vitamins. And if you’re eating for your chakras, then your Sacral and Solar Plexus Chakras will be well nourished too! But most importantly this dish is delicious, wholesome and simple to prepare. 500 to 600 grams of chicken breasts or thighs (that’s about 4 chicken breasts), 2 tablespoons of coconut oil,1 large onion – chopped, 6 cloves of garlic crushed or diced, 2 large carrots chopped into pieces, 1 cup of fresh diced tomato, 2 cups of diced raw pumpkin ( or substitute potato or sweet potato) 1 to 2 cups of chicken stock, 1 x 270 gram can of coconut cream, 1 heaped tablespoon of turmeric powder, 1 tablespoon of fresh lemon juice, 1 to 2 tablespoons of Indian curry powder, 1 large bunch of coriander (cilantro), pinch of good salt. Optional: finely sliced fresh green shallots (green onions/scallions) and red capsicum (bell pepper) as a garnish – gives a big boost of vitamin c! 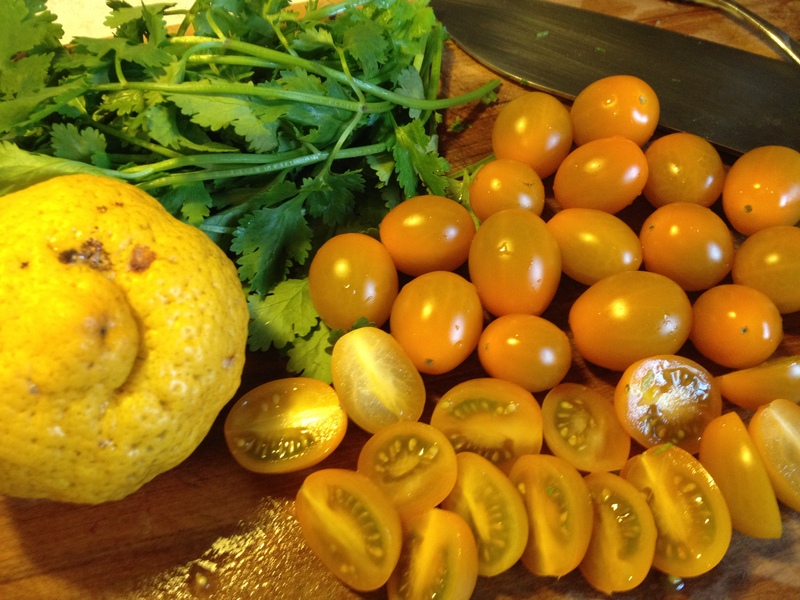 The funny-looking lemon below is a bush lemon from an old tree we found out in a paddock on our farm, and the tomatoes are an heirloom variety from our garden called Lemon Drop. 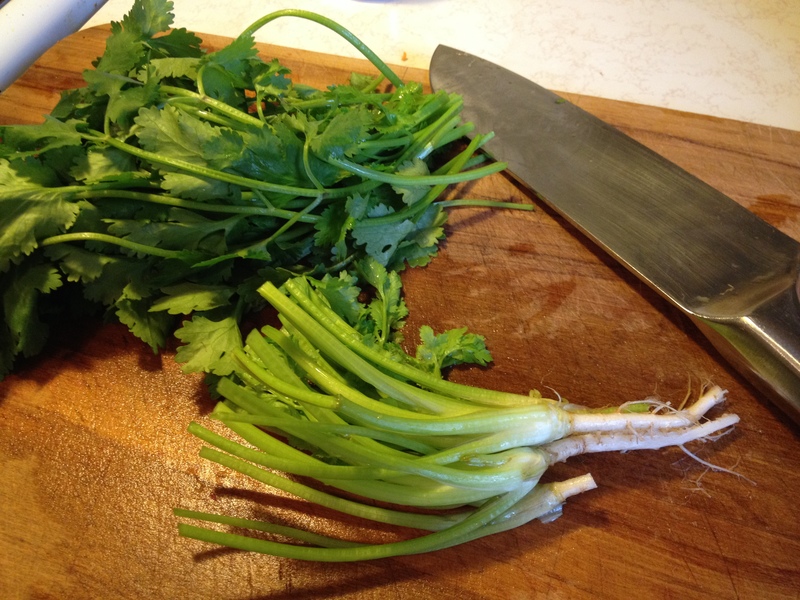 Wash coriander and pat dry with a kitchen towel. Clean away the finer roots and then divide the bunch by cutting the stalks and roots away from the leaves. Finely chop the stalks and roots. Heat coconut oil in a large saucepan over medium heat. Add onion and garlic and fry gently until fragrant but not coloured. 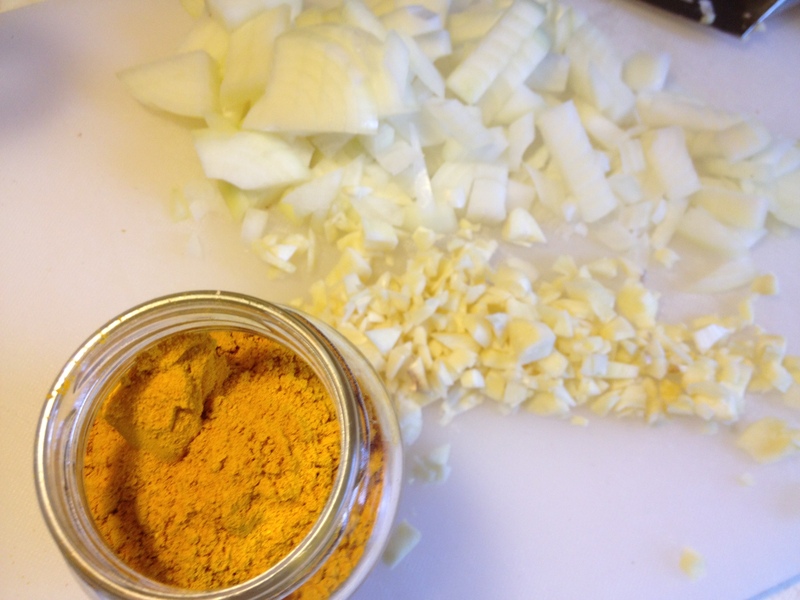 Then add in the turmeric, coriander stalks and roots, and curry powder – 1 tablespoon for a very mild curry and 2 tablespoons (or to taste) for a stronger curry. Add a little chicken stock to moisten the pan..
Then add in the diced chicken and stir until well coated and beginning to colour. Tip in your can of coconut cream and one cup of the chicken stock. Then add your salt, lemon juice, carrot and pumpkin. Mix well. Stir through the diced tomatoes. If it seems a little dry add some more stock. Lower the heat and simmer with lid on for 30 minutes, stirring occasionally to prevent it sticking on the bottom. Taste and adjust seasonings if necessary. 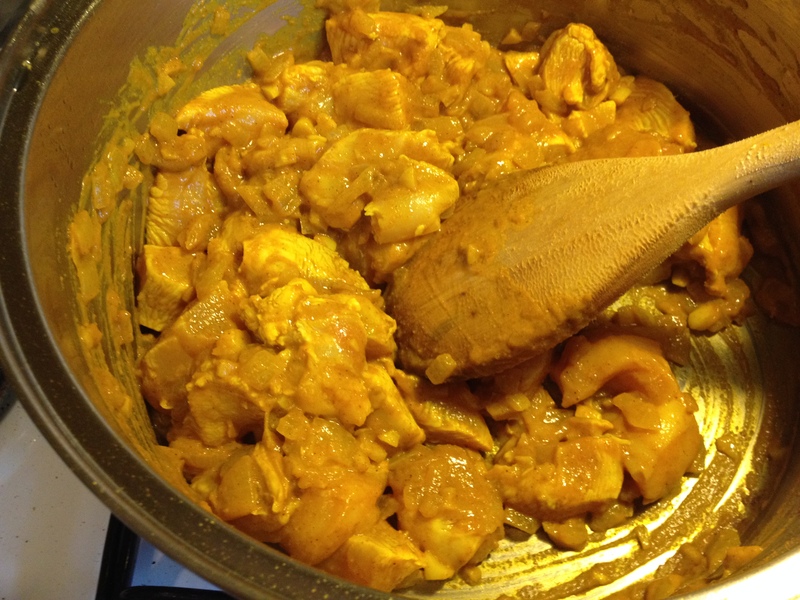 If you prefer your curry to be soupier – with lots of sauce – add the remaining stock and/or top up with a little water. 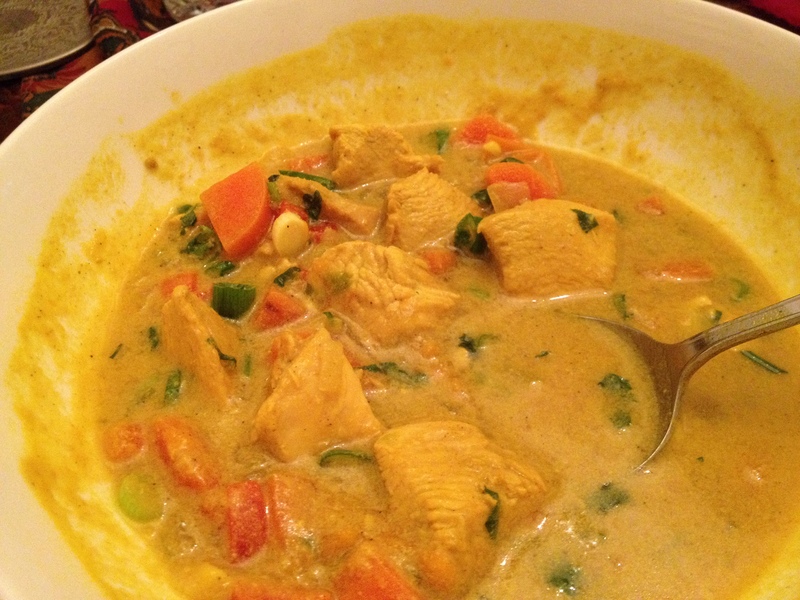 The curry can be served on a bed of rice or as a hearty one-bowl meal. 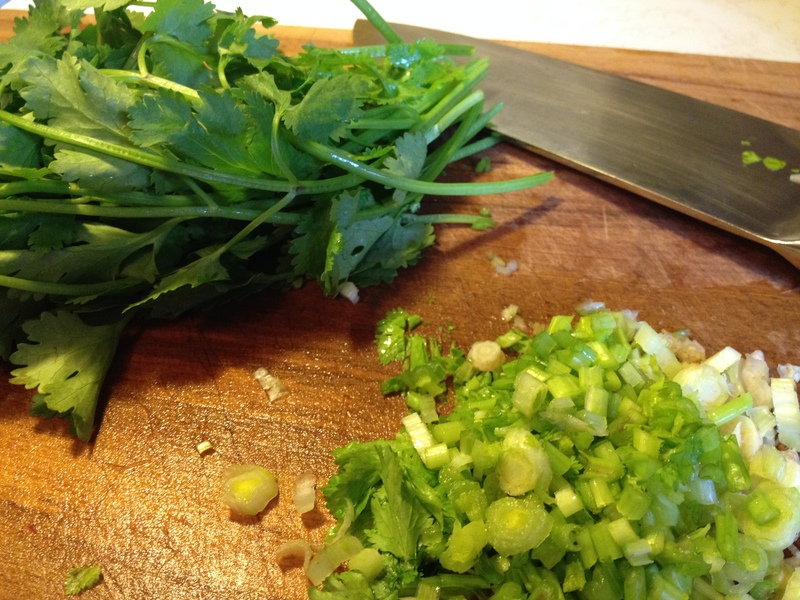 For a final flavour and health boost add some finely chopped coriander leaves, shallots and red capsicum as a garnish. Here’s mine – served without rice. As you can see, I like mine a little soupier. And here’s my bowl about half way through dinner. A lovely nurturing meal. 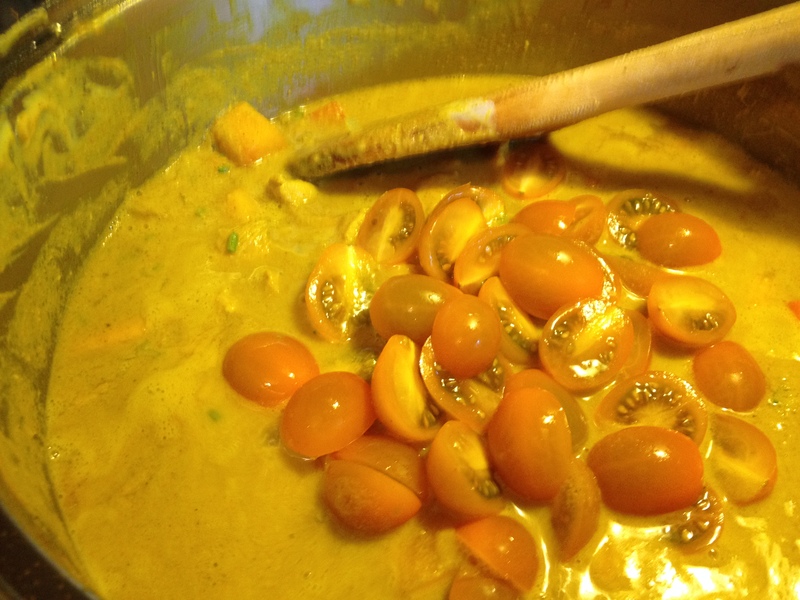 This curry freezes well, and will keep in the refrigerator for four days. Enjoy! 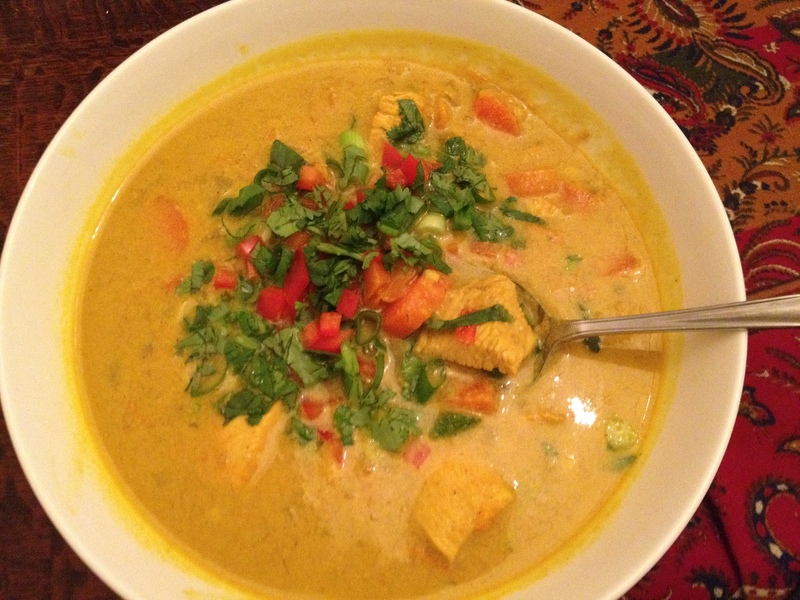 This entry was posted in Gluten-free, Invalid Cooking, Main Courses, Soups and tagged adrenal fatigue recipe, chichen curry with coconut cream, chicken curry, chronic fatigue recipe, easy chicken curry, healing foods, immune boosting food, lyme healing recipe, mild curry recipe by Cauldrons and Cupcakes. Bookmark the permalink. Guess what is on the menu at my place tonight! Thank you it sounds like just what I need at the moment. BTW I made your passionfruit lime cheesecake….O.M.Goodness how devine! Why not have the curry for breakfast? I often do! Got my sister staying next week from South Wales U.K. …SORTED . Glad nurse Burt has done a good job . Just made the curry and it is delicious. About to put on the rice now as I am off to a meeting. I have left it a bit soupy like yours and it looks wonderful, tastes wonderful and has a brilliant aroma right through the house. Thanks again. Keep sharing your recipes. Nicole, we have this as a soup, and it is possibly the best soup invented ever. Period. Full stop. Thank you!!!! !